For those of you who read and enjoyed reading How to Become a Pirate Hunter like my family and I did, you're going to be pretty happy about this announcement: an original soundtrack/companion album of the same name by Tanner Lex Jones has just been released. How to Become a Pirate Hunter's songs go hand in hand with the storyline of the book, generally following the chapters through a character's point of view. Think Wizard of Oz and Pink Floyd's Dark Side of the Moon, but with more satisfying correlations. Admittedly, I'm no music critic. And, full disclaimer, Tanner Lex Jones is my cousin and friend. 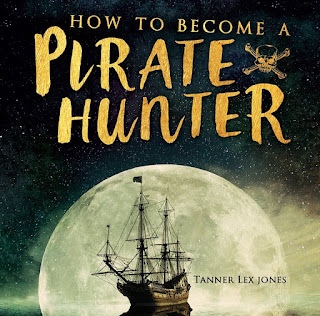 But the truth is that I've both read Marty Reeder's Pirate Hunter book and listened to Tanner Lex Jones' companion CD, and the combination of prose and music is delightful. Each of the album's tracks is catchy, musical, and true to the pirate genre in its own way. The soundtrack is unified in style, and I enjoyed listening to each song's unique flavor and musicality. Through his music, Tanner Lex Jones (and has woven together this engaging storyline, his songs each a unique and distinct thread of the overall tapestry. Track #5, This Boy, about having the faith and guts to risk it when it counts, has been released as the single and is a favorite. I recommend this album in its own right, but especially as a companion to the Pirate Hunter novel. The new How to Become a Pirate Hunter soundtrack is available for purchase on all major digital media marketplaces. You can also place orders for physical copies through the Tanner Lex Jones Facebook page.